Where existing tie rods occur, drive timber sheeting at slight angle. Notch and force together. Figure 3. New steel or timber sheet piling behind existing sheet piling wall. The preferred approach is to install the new wall outboard of the existing wall (Table 5-16). This will reduce the requirement for removing decking and excavation behind the existing wall. However, local environmental restrictions may prohibit a new outboard wall requiring that a new structure be driven inboard. PVC sleeves, collars, and washers to electrically isolate the new tie rod from the old sheet pile. Where an old tieback system is used to support the new wall, PVC insulators are needed to isolate the rod and bolts from the new sheet pile and wale. The sheet pile wall may also be repaired by constructing a new concrete face. Construction of a full concrete face is more desirable than a partial face because it eliminates accelerated corrosion which can occur at the bottom of the concrete face. One procedure for installing a concrete face is described in Table 5-17. The procedure involves driving timber sheet pile to provide a form for the concrete. Movement of sheet pile walls can sometimes be arrested by installation of a new tieback system or by replacement of a deteriorated system. 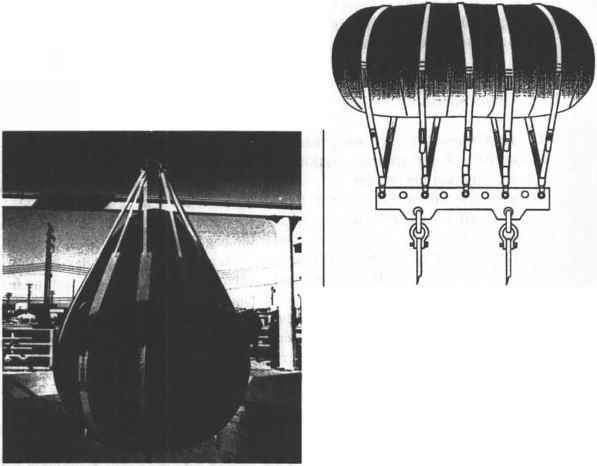 A new tieback system will require installating both a new wale and anchor system. The new wale is installed slighdy above the existing wale. Selecting the omponents of die system and placing the anchor must be made based on structural calculations. Types of tieback anchors that may be used include: pile anchors, deadmen, plate and auger anchors, and grout-injected anchors. Selection of the anchor type will depend on local soil conditions and availability of installation equipment. Grouted-in anchors are an excellent method for providing tieback restrains; however, they require heavy duty specialized equipment to drill the access hole from the outboard side of the sheet wall. Once the hole is drilled, pressure grout pumps are used to form a concrete bulb at the end of the hole. A tie rod is inserted into the grout before it sets. Screw (or auger) and driven-plate anchors provide effective holding power but require heavy duty equipment to provide high reaction forces for inserting the anchor to the required depth. These techniques are not usually used by UCT personnel. Table 5-18 provides a discussion of general procedures for replacing tieback systems using a trenched-in deadman anchor. The procedure is applicable in situations where the surface is accessible to trenching machinery. A trench is dug from the wall back the required distance to the anchor location at the depth of the wale. The trench length, depth, deadman anchor size, and connecting hardware needs to be deteimiiKd by engineering based on a knowledge of the local soils conditions and expected loading on the wall. An important consideration in installation of any new structural material near the ocean is minimiring the potential for galvanic corrosion. Care must be taken to electrically isolate the new tie rod from the existing old sheet pile. PVC washers, sleeves, and collars provide good protection. All new metal, such as a new wale, should be protected by painting. Care needs to be taken on tightening up the new tie rods to prevent overstressing or bending the existing wall. Local slope failure of backfill may prevent the pile from returning to vertical unless the backfill is excavated. If the top of the sheet pile has moved more than 6 inches, then excavation behind the wall is definitely recommended before attempting to pull back the sheet pile. Wall load modification may be required as discussed below. Sheet pile wall movement can sometimes be arrested by changing the soil loading acting on the wall. For example, stone riprap dumped against the exterior toe of the wall will add resistance to the movement. Alternatively, or in addition, backfill can be removed from behind the wall and replaced with a lightweight granular fill. This type of fill has the advantage of being free-draining, which reduces the hydrostatic pressure behind the wall and allows the water level on both sides to balance. Wall load modification is usually carried out by shore-based construction forces. Problem: Major corrosion damage to face of the steel sheet pile with greater than 30 percent of face corroded through sheet resulting in loss of backfill. 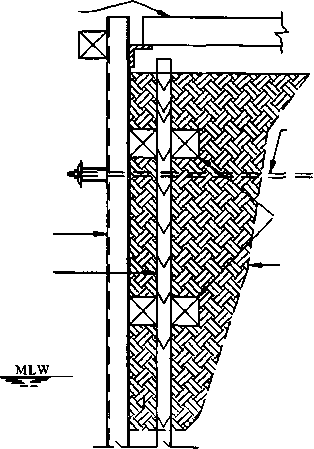 Existing strength of sheet pile wall is adequate for planned use. 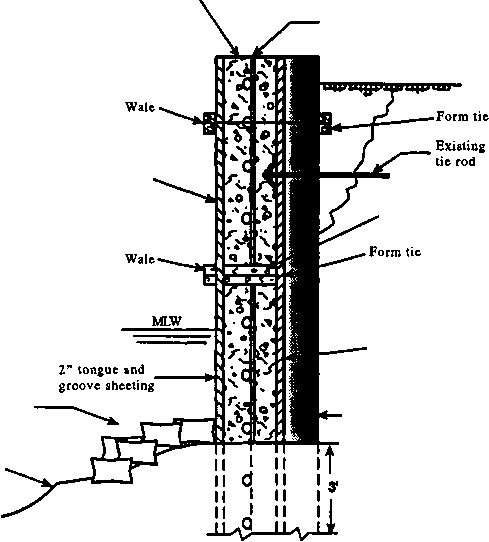 Description of Repairs: (Figure 1) Existing sheet pile wall is covered with concrete over damaged area extending from mudline to deck. • Clean surface of damaged sheet pile to remove marine growth and loose material and rust from face of sheet pile. • Excavate behind seawall to a depth above MLW to provide attachment for blocking and new wales. If not feasible to excavate, then blocking may need to be hung from top of wall or attached to brackets welded to face of sheet pile. • Place and fasten 4x12 blocking against existing seawall to provide a guide and spacing for outer concrete form. Alternatively use sections of pipe for blocking material. • Install two wales: one close to top and one at the blocking. • Weld shear lugs to sheet pile wall extending 4 inches from wall or as directed by engineering. • Install steel reinforcing in center of pour area. • Drive timber sheet pile wall to 3 feet below mudline in front of blocking. • Pour by tremie or pumping methods and allow 7 days cure before removing forms. Application: Used to stop the seepage of soil backfill. How to connect an existing sheet pile wall with a new sheet pile wall? How to tie in steel shear piles? How to concrete face a sheet pile wall? When is one required to use a sheet pile wall?